It’s going up to $10 an hour and will increase by a dollar every year to get to $13 an hour by 2020. There are at least 50 cities, towns and villages that have said no to the pay raise and sick leave requirements, so they’re opting out of the deal passed by Cook County officials. Schiller Park has opted out. 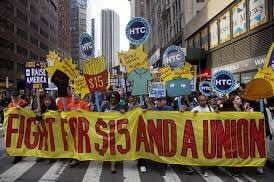 In Chicago, the minimum wage went up to $11 and hour, rising to $13 by 2019. This entry was posted in Chicago, Economic Development, Economy, Employing Disabled, Finance, Illinois, Mayor Caiafa, minimum wage, politics, Taxation, Union and tagged budget, Chicago, cook county, Franklin Park, McCampbell, minimum wage, Nick Caiafa, Rosemont, Roy McCampbell, Schiller Park, Village of Schiller Park, work force. Bookmark the permalink.